One of the final beers brewer Adrian McNulty created for 3 Ravens before heading to Moon Dog was an attempt to fashion a beer that tasted like Pedro Ximenez. The beer was Druid, a strong Belgian ale aged in PX barrels that was a damn fine effort and contributed towards 3 Ravens' Champion Small Australian Brewery title. Continuing the theme, the first beer he has created at Moon Dog that has been bottled for a wider release is his attempt to fashion a beer that tastes like champagne. 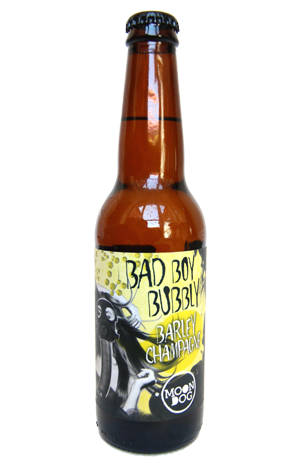 Said beer is Bad Boy Bubbly, inspired by the South Australian cult classic that is described by Moon Dog as "a heart-warming story of the love between a mother and son" and was once handed to The Crafty Pint's founder by a new acquaintance with the instruction: "Watch this and you'll know all you need to about me." A colourful friendship soon followed. As for the beer, he set out to achieve his goal via the use of the palest malt he could lay his hands on, sugar to achieve the desired ABV without too much body, a champagne yeast, Nelson Sauvin hops for their vinous quality, and popping a little of it into new Hungarian oak to lend it the little lactic kick you'd expect of a champagne. The result is a beer that looks like champagne (especially if served in a flute) with high carbonation and a fluffy white head, smells like a champagne (especially with that little lactic kick) and has champagne like qualities to its flavour too. In fact, if they brew it again and can dry it out a little at the finish more the next time around, they might send the appellation wonks at the Champagne Bureau into a serious tizzy fit.